Grew Up… to be a nice, polite young woman (or so it seems). Underneath Michelle’s well-mannered and seemingly boring persona, there’s a another side to her waiting to pop out. Living... in western Michigan. The winters are cold, but fortunately it’s spring now, and that means summer – and band camp – is on the way. Interests… playing the flute. She is also a part-time band camp supervisor. Michelle, a stereotypical “band geek,” spends her summers working at the Tall Oaks Band Camp. Most of her stories start, “This one time, at band camp...” People usually tune out before she can finish the tale, but maybe they shouldn’t. Relationship Status… single. It turns out Michelle wants to go to the high school prom with Jim because she believes that he’s a “sure thing.” She’s found the perfect date in the virginal Jim: they’re both looking for a simple one-night stand. Challenge… fitting in with the popular crowd. Others at her school may dismiss her as a geek, but she is having the last laugh. She has more fun than almost any of them. Personality… cheerful. Michelle, despite her occasional vulgarity, is a sweet and affectionate “girl next door” type. Michelle Flaherty's popularity ranking on CharacTour is #2075 out of 5,000+ characters. See our top-ranked characters and read their profiles. 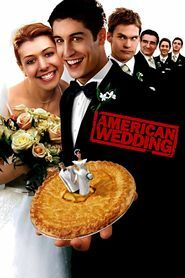 With high school a distant memory, Jim and Michelle are getting married -- and in a hurry, since Jim's grandmother is sick and wants to see him walk down the aisle -- prompting Stifler to throw the ultimate bachelor party. And Jim's dad is reliable as ever, doling out advice no one wants to hear.